Meanwhile, they sang with the Sic F*cks – at CBGBs, Max’s, Mudd Club theme nights, and wherever fun was to be had – and with the Stilletto Fads. Elda Stilletto, who had been the longtime partner to the late Eric Emerson of Andy Warhol Factory fame, was a fixture on the downtown scene. And she never had trouble putting a band together. 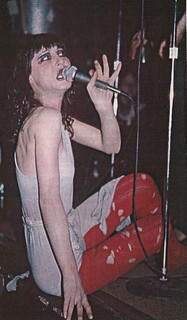 Everyone from Lenny Kaye of Patti Smith Group to Cheetah Chrome of the Dead Boys played with her at one time or another. This line-up included her boyfriend, Scheebo Pampillonia, on drums, and the Wynbradt brothers from the Miamis and Mugzy O’Harlot on guitar. It was a fad and it didn’t last, but it was fun for awhile, the way CBGBs often was. 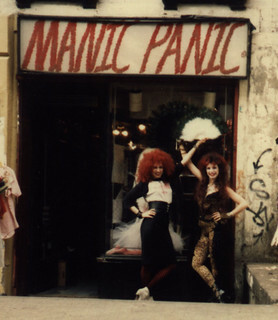 Manic Panic, which celebrates its 35 anniversary this year, is now an empire with a retail store in Los Angeles and international distribution of its signature hair color products. And Tish and Snooky still play out, most recently at the Max’s Kansas City reunion at Bowery Electric. It was fun to be a girl at CBGBs. They showed us how. This story originally appeared on The Local East Village.